Shippers Looking To Increase System Capacity Are Surprised To Find It May Already Exist! As volume increases, it’s not unusual for shippers to consider the pros and cons of adding more capacity which often means increasing the capacity of the shipping sortation system. However, before seriously considering adding new equipment, determine what built-in reserve capacity your current shipping equipment may have. This is a smart thing to do because most sorting systems have excess capacity that was not initially utilized. This is true because typically system engineers select equipment that meets current volume requirements, plus sufficient additional capacity for future growth. This allows the equipment to run initially at a reduced speed, conserving energy and extending the life of the equipment. As volume increases speed can be ramped-up to the maximum rate. Sorting It Out: Shippers Looking To Increase System Capacity Are Surprised To Find It May Already Exist! Sorting It Out: For Shippers - Benefits Of Real-Time Control In The DC Are Huge! White Paper: WMS Solutions: Embedded or Best of Breed? Would a warehouse management system (WMS) help you better manage and automate your warehouse and fulfillment operations? Learn pros and cons of ERP WMS vs Best-of-Breed. Supplier Relationship Management and the Distribution Enterprise:A suite provides enterprises with the necessary tools and solutions to achieve optimal performance in supplier relationships. Android is an Operating System for Mobile Devices such as Smartphones and Tablet Computers. It was Developed by the Open Handset Alliance led by Google. Kollmorgen's Pick-n-Go is a flexible controls platform that can be adapted to any electric order-picker truck brand or model enabling the picker and the truck to work together automatically. Logistics News: What Does a Sortation System for Distribution Cost? Find information, expert insight, vendors solutions, a video overview, case studies and more Warehouse Management Systems (WMS). Includes recent downloadable edition of Supply Chain Digest Letter on WMS. Supply Chain Question: How to Calculate Discount for Customer Freight Pick-Up? 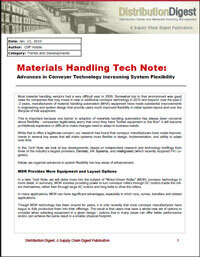 The first analytic reports for the materials handling and distribution industry.